I’ve wanted to tell my story for a while. The story of how I fell into writing and ended up where I am today—including connecting with angels and my dear agent and everything in between. But I can’t do it justice in one post, because really, I feel like my whole journey has been SO guided and inspired. So I’ve decided to tell it in parts. Growing up, I hated reading. Loathed it. Which is crazy, because my parents were pretty much the perfect parents—read to us every night, the whole thing. But I wanted to live my experiences rather than read about them. I was always in my own little world—I totally had secret passageways to other worlds and had invisible people who lived in my backyard. This worked as a ballerina—because being a dancer gave me a reason to pretend and act out these stories on stage. Long story short, I didn’t think I’d EVER be a writer. It collected dust for another couple weeks. 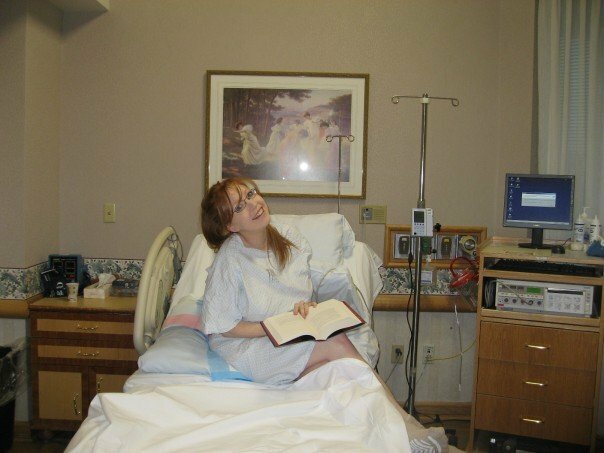 I was 9 months pregnant with our 3rd baby, and went into the hospital to be induced. Hubby brought the book because he thought it’d be funny if I were reading a vampire book in front of phlebotomists. Funny enough, each of the phlebotomists commented on the book and told me I had to read it. I loved it. I fell in love with the magic of the story like so many millions of other people. And something happened. I liked reading. For the first time in my life, I actually liked reading. And then I couldn’t stop. I devoured every book my mother in law threw at me. 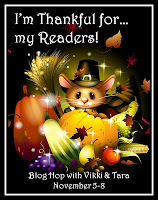 Romances, paranormals, contemporaries, the works. It was fun to escape into another world for a while. Fun to feel magic and experience life through another person. I finally understood what the big hoopla was. I read everything I could get my hands on for the next YEAR. Of course, at the time, I had no idea I was unconsciously learning the craft, analyzing plot structure, beautiful phrases, and how to put words on paper. Fall 2008 came. Our second child was diagnosed with Leukemia. This story is a whirlwind of it’s own--and not one I’m going into--but worth mentioning because it was this experience that took away the magic of reading for me because I couldn’t ever get rid of the fear of having such a sick child. Reading wasn’t enough anymore. Which is what spirals us into the day I wrote my first sentence. And why I started writing. Which will be told in the next segment! Which can be found here: Part II. Part III. Part IV. This weekend Tiana Smith and I hosted a dinner for writers here in Utah. There's nothing better than meeting up with your own breed of people. And there are so many of us here! 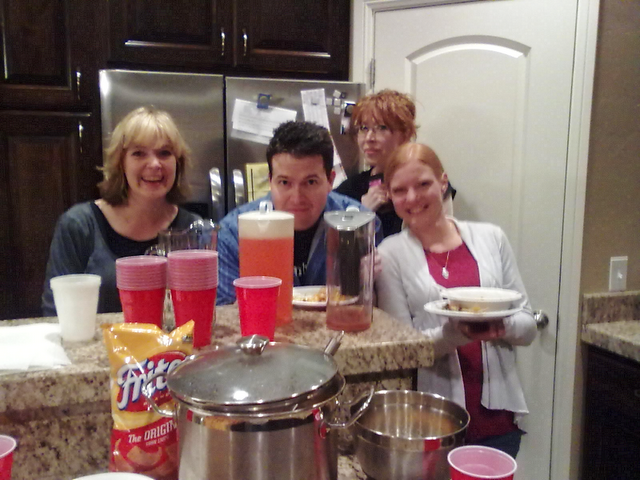 Someone needs to do a study and figure out why there are so many Utah writer/bloggers. Me and Tiana.--------> Not sure what kind of look I'm sporting with my orphan-messy hair... but heh, it was a busy day, alright? <-----And the life/celebrities of the party. Shelly and Chad Morris. 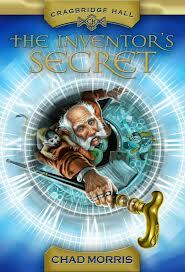 We made Chad tell us his publishing adventures and forced him to give us free swag about his upcoming book 'The Inventor's Secret' out in March by Shadow Mountain Publishing. Do you guys have writers near you? If you do, I highly encourage you to reach out and connect. It's amazing how much inspiration and support can come from just getting together and talking the talk. It's so easy to sometimes feel so alone on this journey, and just knowing that we're not can make the biggest difference. Ever attended a Christmas party where you bump into the person who was always there for you during the last year? You'd thank them for being such a RockStar, right? If there's one person in the Blogisfear who you want to say cheers to, who would it be? For us, it was a no-brainer. Alex "no hyperlink needed" Cavanaugh. 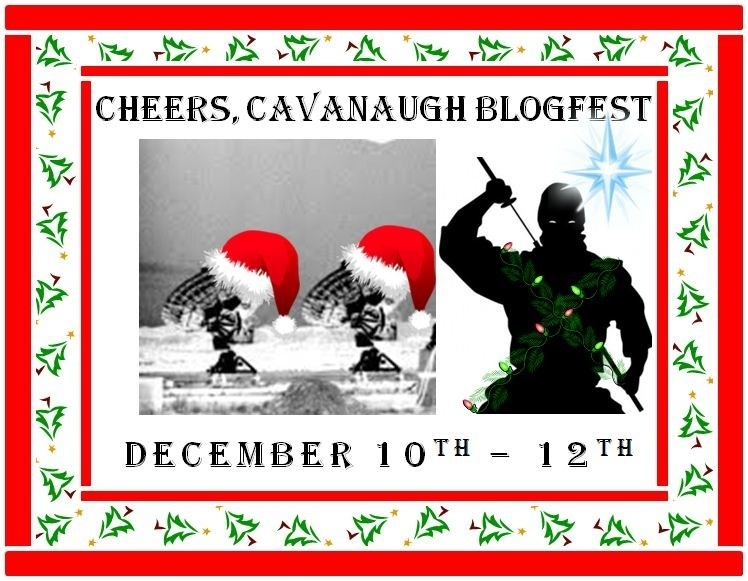 Welcome to the "Cheers, Cavanaugh BlogFest." 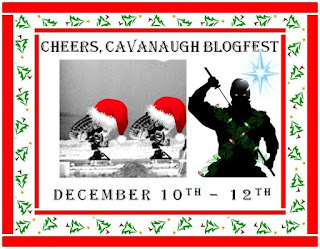 Hosted by Mark Koopmans, Morgan Shamy, David Powers King, and Stephen Tremp, the BlogFest runs from December 10-12. 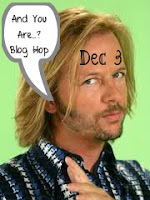 While Alex is an awesome blogger, he's also an enigma. GRAND PRIZE*: A picture of Alex and a download of him playing the guitar. 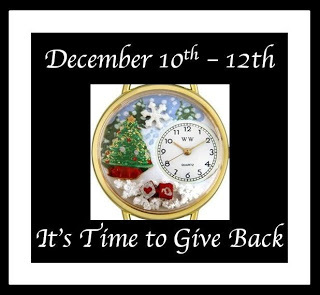 The Linky is open until Dec. 12, 2012. AMAZING, right? I'm freaking out about the Grand Prize. Who doesn't want to see what the ninja captain looks like??? And hear him play??? Seriously. I'm so excited for this BlogFest. Alex has done SO MUCH for this community and I'm so grateful for the chance to help give back. First off, I've done something amazing. 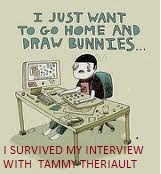 If Tammy asks you do to an interview, BEWARE! I barely made it out alive. But I wanted to take Tammy up on her challenge because I'd heard she gave a mean interview and I wanted to prove I was up for the challenge! If you want to check it out, click here. I love it when we can lift each other up, support each other, and not view each other as competition. It’s about creating magic… creating something that can transport the reader and immerse them in something that can uplift, inspire, or ease the burden of real life. And that can’t happen without people who take the time to STOP, care, and lend an offering hand. 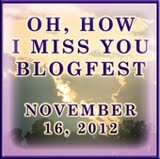 And last, if you haven't checked out the mysterious blogfest yet, you can do so here. November 19 can't come soon enough!